This week’s weed is not really a weed…unless it escapes. If you look in the ditches along the roadside you will often see purple flowers. The purple flowers are very often hairy vetch. 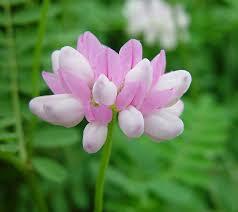 ​There are about 150 species of vetch, members of the pea family. About 25 vetch species are native to the United States but others have been imported from Europe or western Asia. 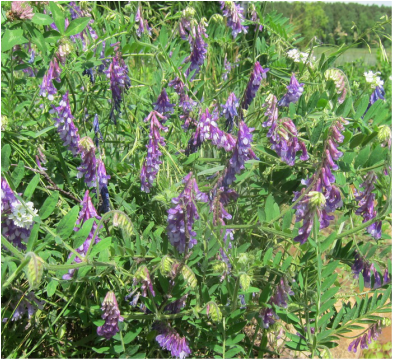 Crown vetch, for example, was imported in the 1950s to reduce erosion along roadsides. 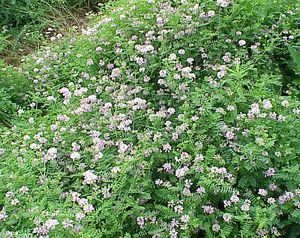 Now, although in many states crown vetch is considered an invasive weed, people still buy seeds to plant it. Hairy vetch and common vetch are also frequently planted as a cover crop. ​Hairy vetch, (Vicia villosa), aka sand vetch or winter vetch, is the most winter-hardy of the vetches. 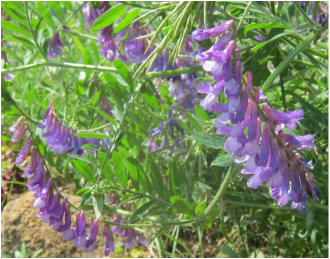 It is the only vetch species that can be planted in the fall and be mature the next summer and the only vetch that can be grown in the Upper Midwest. It will not survive without snow cover, however, so sometimes a companion crop is planted with it for winter protection. The cover grows slowly in fall, but root development continues over winter. 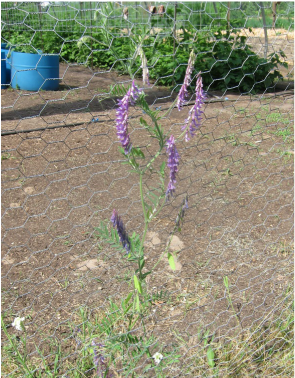 In the spring hairy vetch quickly becomes a sprawling vine up to 12 feet long if it has some means of support such as being able to cling to other plants. It’s early growth smothers weeds while adding nitrogen to the soil. It’s often used to inhibit erosion as well. Some people plant vetch in their pasture because it is hardy enough to survive animal traffic in early spring and supplies a crop for grazing before the other grasses are ready. It’s really critical to be aware of the different vetches when it comes to feeding animals. Horses thrive on common vetch even better than on clover or rye grass and cattle will fatten faster on vetch than most grasses. There is some danger, however, of colic or digestive issues if an animal eats too much, especially after the pods are formed. ​Crown vetch, on the other hand is toxic to horses and non-ruminate animals. Animals that chew their cud, such as cows, sheep and goats are able to eat crown vetch because the offending compounds are absorbed in their more complex digestive system but in an animal without the ruminate digestion it can cause weight loss, lack of muscle coordination, posterior paralysis and eventually death. What puts vetch in the weed category is that the hairy vetch, an annual, drops its seed early and once established it’s very difficult to eradicate. Crown vetch, a perennial, spreads by rhizomes under ground as well as by seed dispersal. Vetch’s heavy and fast growing vines shade out native plants, even “crawling” over small trees and shrubs; it will eventually take over large areas of ground. The vines can also cause problems by tangling in machinery. ​On the other hand, it is beneficial for fixing nitrogen in the soil and organic farmers often plant hairy vetch as a companion plant for tomatoes. When it is time to plant, the vetch is cut to the ground and tomato seedlings are planted in holes dug through the matted residue and stubble. The vetch vegetation provides both nitrogen and mulch that preserves moisture and keeps weeds from sprouting. Sometimes farmers grow vetch as a green manure and till up before it flowers and goes to seed. ​I remember my dad seeding a steep hillside year after year hoping to improve the soil and reduce erosion. For some reason it never seemed to survive. I don’t remember there ever being vetch on that hillside. Now I wonder if he was sowing crown vetch instead of hairy vetch. Crown vetch is prettier, but not winter hardy in this area. 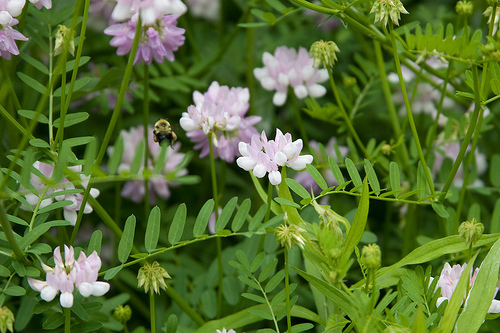 ​I don’t worry about vetch in my garden too much because it has its benefits. I pull it when I get around to it or when it gets in my way. I also think it's kind of pretty.